Croup is rarely seen quinoa on the shelves of Russian stores, so not very popular. However, dishes made from quinoa, have a pleasant taste and can diversify the diet. Quinoa is a cereal with ancient history. The first mention of cereal found in the culture of the Incas. This is a very tasty product with high nutritional value. However, due to high calorie dishes quinoa is unlikely to be suitable for the diet. In buckwheat contains a large amount of vegetable protein, especially essential for vegetarians. In addition, crop contains amino acids and vitamins necessary for the body. Eating cereal crop, the person gets almost all of the components that are found in meat products. Croup comes on the Russian markets of Latin America, which prohibited the use of genetic modifications. It is not recommended to enter in the menu quinoa people with kidney disease due to the presence of oxalates in the rump. But this product can safely be consumed by patients suffering allergies because grains contain gluten. I must say, the cooking process of cereals is no different from cooking other grains, for example, Fig. It is advisable not to rinse the grain before cooking. In this case, the dish will become bitter flavour. But in boiled rump will remain much more nutrients. If bitter taste causes hostility, cereals soaked in cold water for several hours or overnight. The grain is thoroughly washed and put in the pan. Pour cereal with water in the ratio 1:2. Boil quinoa should be under strong heating. As soon as the water boils, reduce heat to low and continue to simmer the beans for 15 minutes. Grits are ready it looks original. The inside of the grain turns transparent center, which is surrounded by a shell. The taste and texture, quinoa looks a little like delicate couscous. The rump is often compared to caviar, as in the use of grains quinoa burst like eggs. Be aware that when cooking quinoa increases in size about 4 times. Therefore, it is recommended to use for cooking a bowl of appropriate volume. To croup has become more crisp, you can pre-bake it in a pan for 2-3 minutes. Especially this method is suitable for side dishes. 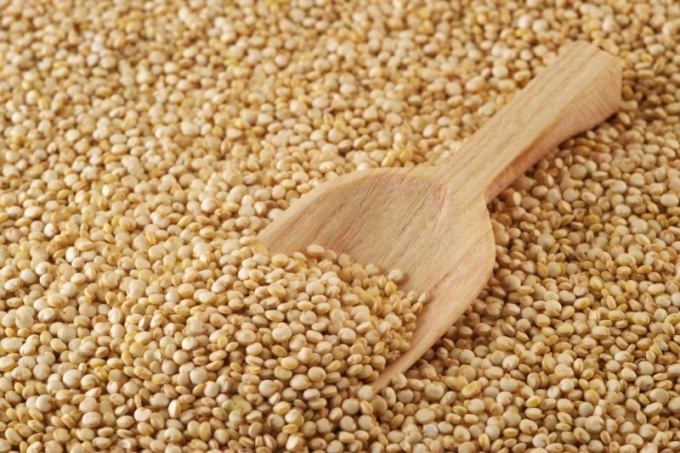 Salting the finished dish is optional – quinoa has a lot of minerals, gives the dish a salty taste.